Under pressure from critics including the most powerful employer in Arkansas, Governor Asa Hutchinson has asked for changes to the state's controversial religious freedom law. The move comes a day after the CEO of Arkansas-based Walmart (WMT) asked the governor to veto the bill, which was approved Tuesday by the Arkansas House. 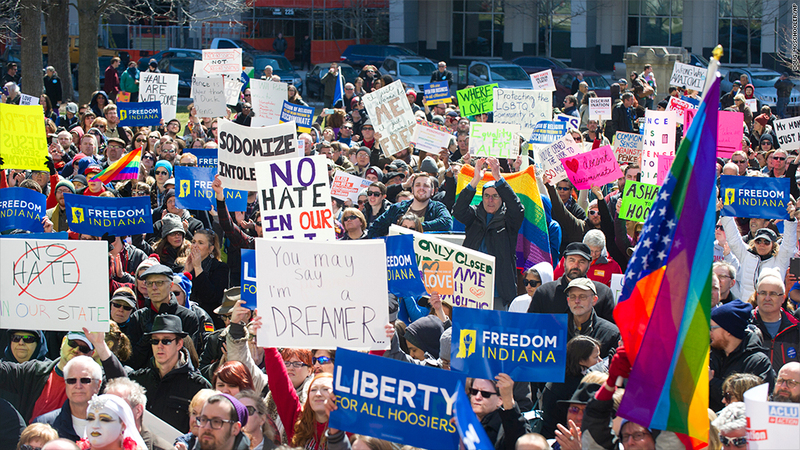 The law is similar to the one adopted by Indiana last week, which sparked outrage from those who say it opens the door for discrimination against gays and lesbians. "We commend Governor Hutchinson and legislative leaders for reconsidering" the bill, Walmart (WMT) said in a tweet, adding that it hopes lawmakers will "make certain any legislation does not encourage discrimination." The retailer is headquartered in Bentonville, Arkansas. In addition to Arkansas, there are 14 other states looking at similar proposals this year, according to the National Conference of State Legislatures. A number of big companies have spoken out against the Indiana law, including Starbucks (SBUX), Apple (AAPL), Angie's List (ANGI), Yelp (YELP), Salesforce (CRM), and Eli Lilly (LLY). NASCAR, as well as the NCAA, NBA, WNBA, Indiana Pacers and Indiana Fever have also expressed disappointment. And Connecticut banned all state-funded travel to Indiana over the law. On Tuesday, Indiana Gov. Mike Pence pledged to "fix" the controversial law to clarify that it does not allow discrimination against gays and lesbians.